It has been a mostly forgettable 2011 season for the Los Angeles Dodgers. In addition to team owner Frank McCourt declaring bankruptcy, the Dodgers have not been over .500 since they were 14-13 on April 29. They have been as many as 14 games below .500 and as far back as 14.5 games in the National League West. A recent stretch in which Los Angeles has gone 30-19 since July 23, which, at the very least, has moved the Dodgers back into respectability with the possibility of a winning record. They are currently 73-75, a full 13 games behind the Arizona Diamondbacks in the West. Only looking at the outside of the Dodgers’ season does not paint the full picture of how exactly this year has gone in Chavez Ravine. Sure, there are a lot of depressing scenes that come from this season. One of baseball’s most storied franchises is bankrupt. The Dodgers have mostly put a poor product out onto the field. But they also have a young pitcher who is on the verge of making history. Clayton Kershaw had shown signs of filling his potential the past two seasons. 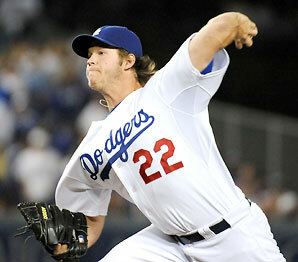 Over 62 starts and one relief appearance, Kershaw was 21-18 with a 2.85 ERA and 1.202 WHIP in 375.1 innings of work. He struck out 9.5 batters, allowed only 6.7 hits but also walked 4.1 hitters per nine innings. He has combined those signs of fulfilling his potential in 2009 and 2010, the electric stuff, high strikeout rate, low hit rate and ERA, with much more command and control of his pitches on the mound to become one of the game’s most dominant pitchers, an unfortunate reality for opposing hitters. Kershaw has lowered his walk rate this season to just 2.1 batters per nine innings to go along with his NL-leading 6.8 hits allowed per nine for a miniscule 0.983 WHIP, which is the third best in the majors. As a result, Kershaw is contending for the pitching Triple Crown. He has won 19 games, which is tied with Arizona’s Ian Kennedy for the most in the NL. Kershaw also leads the league in ERA (2.30) and strikeouts (236). There have been seven different pitchers who have won the Triple Crown since 1966. The pitchers who have won this award since then- Steve Carlton, Dwight Gooden, Roger Clemens (twice), Pedro Martinez, Randy Johnson, Johan Santana and Jake Peavy – have combined for 1,641 wins and 22,561 strikeouts over 23,387.2 innings. They have won 23 Cy Young Awards and been named to 49 All-Star teams collectively. However, there is something to the Dodgers organization about the year 1966 that links Kershaw to part of a special piece of the team’s history. 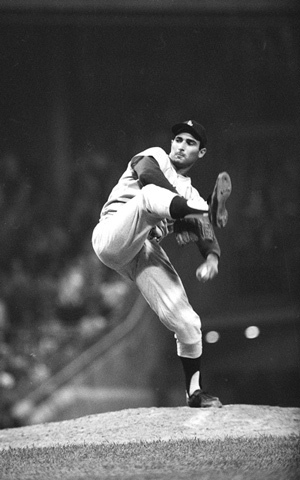 Sandy Koufax won the pitching Triple Crown in 1966 by going 27-9 with a 1.73 ERA and 317 strikeouts in 323 innings. It was his third Triple Crown award in four years. No pitcher has ever had a more dominant stretch. Unfortunately for the Dodgers and the game of baseball, Koufax was forced to retire after the 1966 season because of an arthritis condition in his left arm. It is a shame baseball was never able to see the staggering career numbers Koufax would have undoubtedly put up. With Koufax also went the historic Dodger teams that won four World Series titles and were anchored by Hall of Famers Jackie Robinson, Duke Snider, Pee Wee Reese, Roy Campanella, Don Drysdale and Don Sutton. Los Angeles did not win another World Series championship until 1981. Clayton Kershaw has given Dodgers fans something to celebrate in what has been a mostly dreary 2011 season. He has a chance to become a part of the Dodgers’ rich pitching history by having a legitimate shot to win the Triple Crown. He has a comfortable lead in strikeouts (24 more than second-place Tim Lincecum) but must break a tie with Kennedy for wins while fending off Philadelphia’s Roy Halladay in both that category (Halladay has 18 wins) and ERA (Halladay has a 2.34 ERA). If he can do so, his achievement will instantly connect him with a Dodgers pitching legend- Sandy Koufax. This entry was posted on September 15, 2011 by Scott Kornberg. It was filed under Clayton Kershaw, Los Angeles Dodgers and was tagged with Brooklyn Dodgers, Clayton Kershaw, Doc Gooden, Dodgers, Don Drysdale, Don Sutton, Duke Snider, Dwight Gooden, Ian Kennedy, Jackie Robinson, Jake Peavy, Johan Santana, Kershaw, Los Angeles Dodgers, Pedro Martinez, Pee Wee Reese, pitching Triple Crown, Randy Johnson, Roger Clemens, Roy Campanella, roy halladay, Scott Kornberg, Steve Carlton, Triple Crown.